In 2011, Emma Donoghue is reported to have said her next novel would be based on the ‘true story of a murdered nineteenth-century cross-dressing frog catcher’. While this is exactly what Donoghue delivers, Frog Music is so much more than that. Donoghue draws on over 50 newspaper articles, as well as a wealth of other contemporary resources, to create a fictionalised account of the life and death of Jenny Bonnet, a woman who caught frogs for a living, and who broke the law every day, simply by dressing in men’s clothing. Set in 1876, the city of San Francisco is in the grip of a heat wave and a smallpox epidemic is raging. Jenny quite literally crashes into French burlesque dancer Blanche Beunon, and a staunch friendship is formed. When Jenny is murdered, it is Blanche, believing she was the intended victim, who sets out to bring the killer to justice. As the events leading up to the murder unfold, we are given a picture of the seedier side of life in San Francisco’s Chinatown – poverty, baby farms, child abuse, prostitution and racism. In piecing the story together, Blanche soon discovers that she didn’t know her dead friend as well as she thought she did. Jenny had, in many ways, created her own version of history, hiding her scars behind a nonchalant facade. Interwoven through the story is, of course, the music: lullabies, folk songs, circus songs, hymns, and what Donoghue describes as ‘dirty crowd-pleasers’. 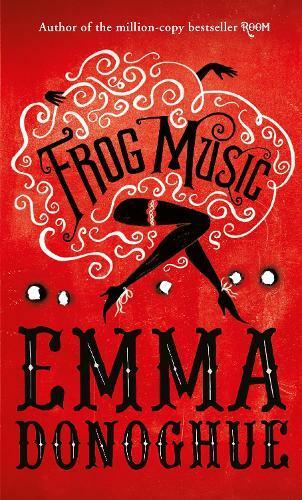 Frog Music is Emma Donoghue’s eighth novel, and while it is very different from her award-winning Room, it is just as gripping. It is not only a thrilling, historical ‘whodunnit’, but an exploration of the social ills of the time – a book that will make you want to read more about this still unsolved crime. Sharon Peterson is from Readings Carlton.